Breadmakers are increasingly popular as many people want to enjoy freshly baked bread at home. Home baking with breadmakers, can produce a mouthwatering aroma throughout your house, sometimes in less than an hour and at the touch of a button. But with many breadmakers on the market how should you choose one? Here are the key features to look for. Depending on the breadmaker it may be designed to make a variety of loaf sizes. You should pick a size which suits your use, if you are on your own you may want a smaller size to reduce food wastage or some more expensive breadmakers have the ability to make multiple sizes of bread. Breadmakers have a number of programs. Check that the breadmaker you are buying is suitable for the kind of breads you wish to make. Eg program settings could include white bread, bread rolls, wheat-free bread, raisin bread. Breadmakers don’t just make bread though. More advanced breadmakers have settings for pizza bases, rolls, scones, croissants and more. Some breadmakers will even have a Jam setting to make jam in. For a breadmaker to be truly versatile it should have manual programmable settings so that you can create your own cooking cycles to create your own recipe variations. Rather than having to stand over the breadmaker waiting for the perfect moment to add fruit and nuts. A dispenser will automatically mix in the fruit and nuts at the right time for you. Some breadmakers without a dispenser will have an audible beep to signal the right time to add the fruit and nuts. Perhaps you want to wake up to fresh bread? A delayed start will allow you to program the machine and then it will start automatically a number of hours later. There are several other features that could be important for your uses. They could be. A viewing port – A plastic or glass port in the top so that you can see the bread cooking. If you are designing your own recipes this could be invaluable to help define cooking times. Non Stick – For easy cleaning purposes you may want a non stick bread pan to make life a little easier. Also for the same purpose does the lid fully detach for easy cleaning. Cool wall – Breadmakers can get very hot. Ones with a cool wall function are insulated to keep the outside walls cool. Perfect if you have children. Warranties – Some breadmakers may have a extended manufacturers warranty. From the above you will see there is a lot to consider when buying a breadmaker. Here are some of the most popular breadmakers available. Hopefully one will be perfect for you. 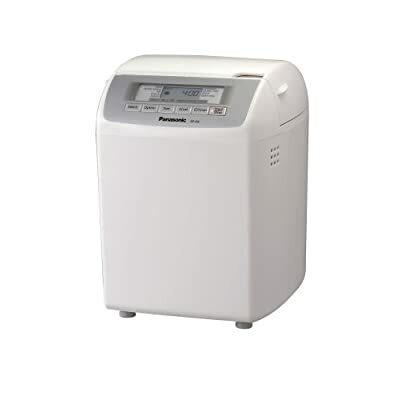 The Panasonic SD255 Breadmaker is considered by many as the best breadmaker on the market. It has all of the key features you would expect from a premium breadmaker including a raisin dispenser, 3 loaf sizes, up to a 13 hour delay timer, included is a UK recipe book. At the time of writing 94 customers have reviewed th is item on Amazon, 84 of which received 5 out of 5 stars Click to find out more information and buy. If you want more help baking the perfect loaf or want to expand the recipes you cook here are some popular cookbooks for making bread. 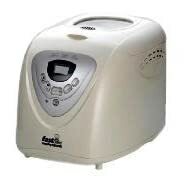 Fresh bread in the morning from your bread machine by Annette Yates will help you get the most from your bread maker. Here’s what the publishers say. So why do you need this book when bread machines come with their own recipes? Well, such recipes vary, sometimes on the high side, in the amount of yeast, salt, sugar, fat and dried milk powder they contain. Annette Yates has set about reducing these ingredients and providing recipes for making loaves that are as natural as they are likely to be. And they are delicious too.